As I read the first half of Katherine Applegate's The One and Only Ivan, I wondered how its intended young audience would make it through the book. Yes, this novel in verse is simply written and has appealing illustrations, but it is genuinely sad. Telling the tale of a silverback gorilla named Ivan, we learn about his isolated life at Exit 8's Big Top Mall. 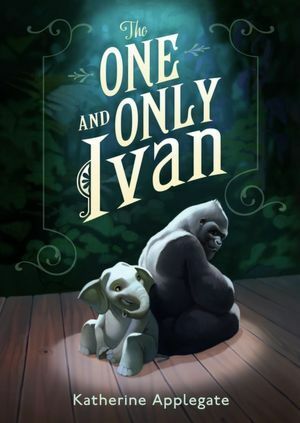 Despite his friends, an ailing elephant and a homeless dog, Ivan is depressed and spends his days watching TV and wishing to go outside his 'domain', which he slowly realizes is just a cage. I wanted to abandon this book many times. It made me feel guilty and hopeless. I'm happy I didn't, because Applegate offers redemption in the end, although I don't know that all young readers will get to that part. My eight year old daughter just read it and she loved it!